OAKLAND, Calif. -- Golden State Warriors power forward Draymond Green is suspended for Game 5 of the NBA Finals on Monday night after he was assessed a flagrant foul 1 by the league for his actions in Game 4. 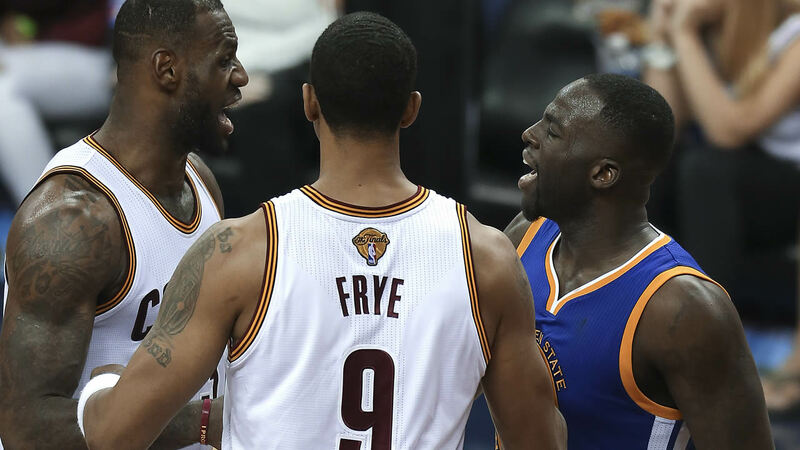 The play in question came with less than three minutes left in Golden State's108-97 victory over the Cleveland Cavalierson Friday, whenGreen and LeBron James got tangled. James stepped over Green after the Warriors forward fell to the court, and Green swung his arm and appeared to make contact with James' groin area. James immediately turned around, and the two players went chest-to-chest as play continued. The NBA called Green's action a"retaliatory swipe of his hand to the groin" of James. The flagrant 1 gave Green his fourth flagrant foul point of the playoffs and led to an automatic suspension. "The cumulative points system is designed to deter flagrant fouls in our game," NBA executive vice president of basketball operations Kiki VanDeWeghe said in a statement. "While Draymond Green's actions in Game 4 do not merit a suspension as a standalone act, the number of flagrant points he has earned triggers a suspension for Game 5." Earlier in the postseason, Green was assessed a flagrant 2 and fined $25,000 for kicking Oklahoma City Thunder center Steven Adams between the legs. He received a flagrant 1 for throwing down Houston RocketsforwardMichael Beasley in the first round. Several other of Green's actions have been reviewed by the league with no punishment given. James received a technical foul for physically taunting Green in Friday's altercation, the NBA announced. The league completed its investigation over the weekend, looking at numerous angles of the play and interviewing James and Green as part of the process. The NBA also announced that Cavaliers coach Tyronn Lue has been fined $25,000 for his public criticism of the officiating after Cleveland's Game 4 loss. Under league rules, Green cannot be in the building as the Warriors attempt to clinch their second NBA title. If a player comes to a game in such a case, he would face a fine. Green will be docked a game check for the suspension, which will cost him about $140,000. In reaction to the suspension, the Warriors, who lead the best-of-seven series 3-1, dropped from a 6.5-point favorite to a 6-point favorite at theWestgate Las Vegas SuperBook.